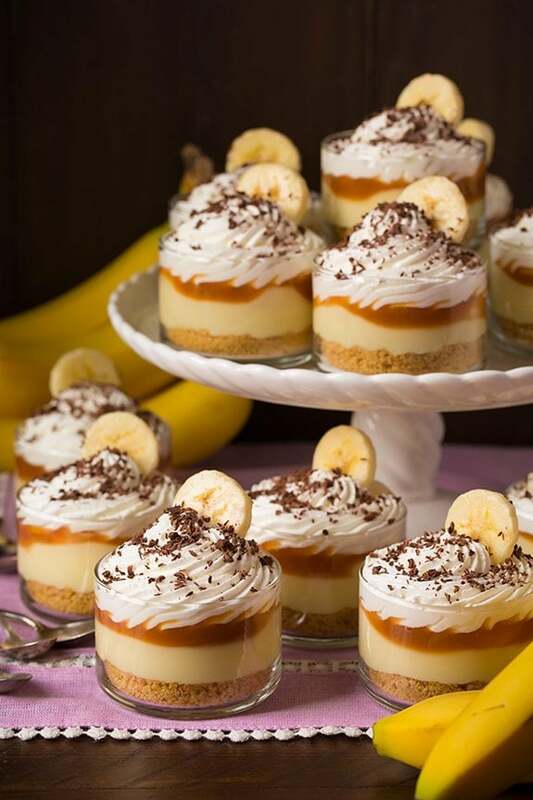 Individual Banana Cream Pie Cups with Salted Caramel Sauce – need I say more? 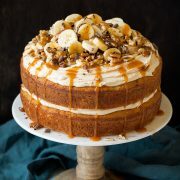 FIVE layers of decadence that’s sure to impress! Layered with buttery graham cracker, creamy custard, fresh banana slices, rich salted caramel sauce and finished with fluffy whipped cream. I made mine with only one layer of bananas over the pastry cream layer and I decided they definitely needed a second one underneath (after I’d already piped mine out. Really I just under-estimated how much pastry cream I actually had I wanted another layer but I was way off) so your pastry cream layer may look just a little bit thicker than mine since the bananas on bottom will take up some of that space and they may end up a little taller in the end too, but not by much. 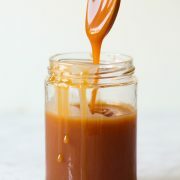 I used homemade salted caramel sauce which I highly recommend and I’ve linked to the recipe for that in the recipe below. 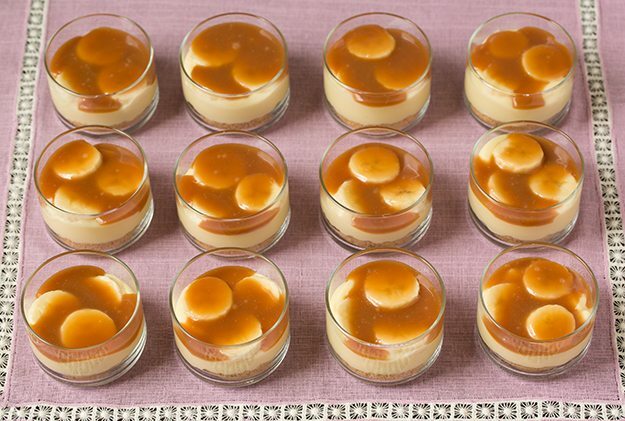 Of course you can use your favorite store bought salted caramel sauce if you don’t have time to make it. If you wanted to do a super cheater version here of this same idea you could do all the short cuts, it obviously just won’t be as good. 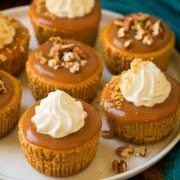 You could buy store bought graham cracker crusts and crumble them up then you could do 2 smaller boxes vanilla pudding mix (substituting some cream for milk and using a little less than listed), store bought caramel and store bought whipped cream. I don’t know why I’m even saying that to you because these are out of this world amazing and all of the store bought ingredients will never come close to measuring up. I guess I know there are many people that love the easiest route even if it means sacrificing flavor. So if that’s your thang that’s your thang and I don’t judge. 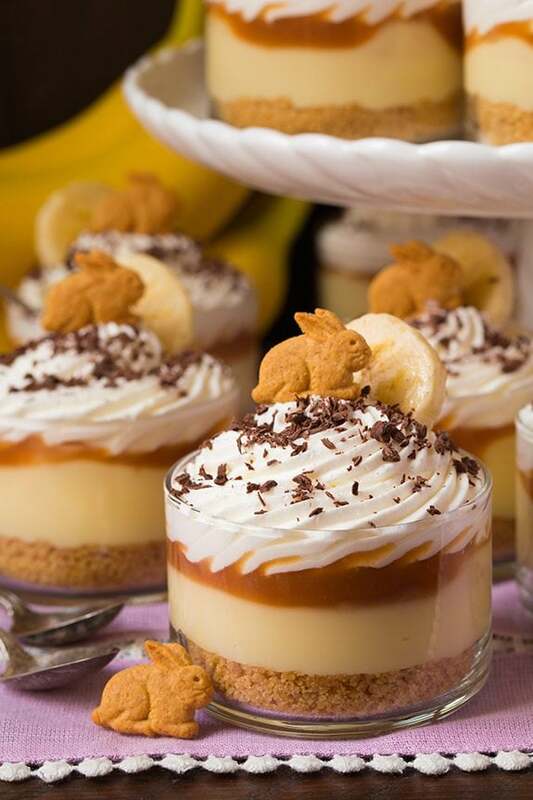 I know we don’t all have hours to spend in the kitchen – but for Easter I hope you all have some extra time to make something special like so. Holidays are meant for going all out, right? Gimme ten years and 80 parties later, maybe I won’t be saying that anymore :). 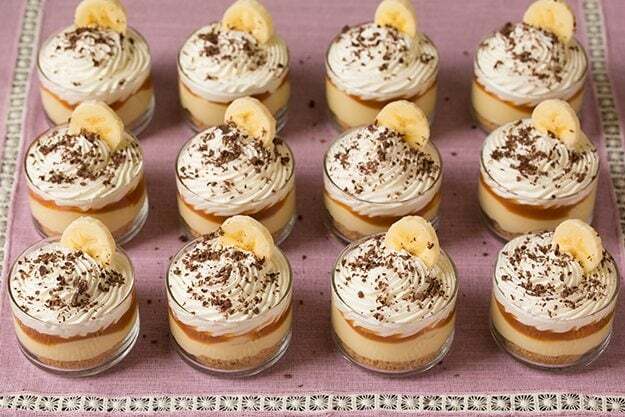 Banana Cream Pie Cups with Salted Caramel Sauce! Need I say more? FIVE layers of decadence that's sure to impress! Layered with buttery graham cracker, creamy custard, fresh banana slices, rich salted caramel sauce and finished with fluffy whipped cream. For the pastry cream: In a medium saucepan combine milk, cream, 1/4 cup sugar and salt. Bring mixture to a light boil over medium heat, while whisking to dissolve sugar. Remove from heat and let rest several minutes. Meanwhile in a medium mixing bowl whisk together 1/2 cup sugar with cornstarch then add in egg and egg yolks. Using an electric hand mixer set on low speed whip mixture until pale and fluffy, 1 minute. While whisking egg mixture add 2/3 cup of the hot milk mixture to egg mixture. Then while whisking milk mixture in saucepan pour egg mixture into saucepan. Cook mixture over medium heat, stirring constantly until it has thickened well, about 4 - 8 minutes (whisk vigorously near end to prevent lumps. Mixture should become like a thick pudding, if it starts to separate you can remove from heat and beat with electric mixer to smooth). Remove mixture from heat, stir in vanilla and immediately force through a fine mesh strainer into a medium mixing bowl. Cover with plastic wrap, while pressing plastic directly on surface of pastry cream to prevent a skin from forming. Chill in refrigerator until chilled through, about 4 hours (meanwhile prepare and cool salted caramel sauce if making homemade - which is what I used here). For the crust: In a mixing bowl whisk together graham cracker crumbs and granulated sugar. Pour in melted butter and stir until evenly moistened. For the whipped cream topping: In a large mixing bowl whip heavy cream until soft peaks form, add 3 1/2 Tbsp sugar and whip until stiff peaks form. Chill until ready to assemble then transfer to a large pastry bag fitted with a star pastry tip. 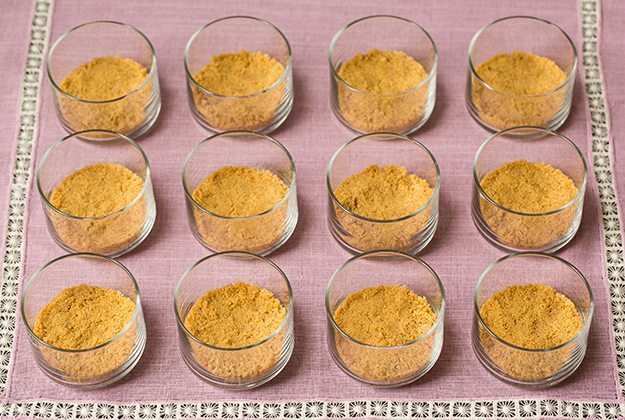 To assemble: Divide graham cracker mixture among 12 small dessert cups, adding about 2 Tbsp to each and gently press into an even layer. Add 3 banana slices over graham cracker layer in each. Transfer chilled pastry cream to a piping bag fitted with a large round tip (if it's super thick you can fold it a few times before adding to pastry bag) and pipe over banana layer. Add 3 more banana slices on top of each. Spoon a scant 1 Tbsp of caramel sauce over second banana layer (work to evenly drizzle it, if caramel sauce is thick you may need to warm it in the microwave a little - just don't let it get warm). Pipe whipped cream over caramel layer then sprinkle with chocolate shavings if desired. 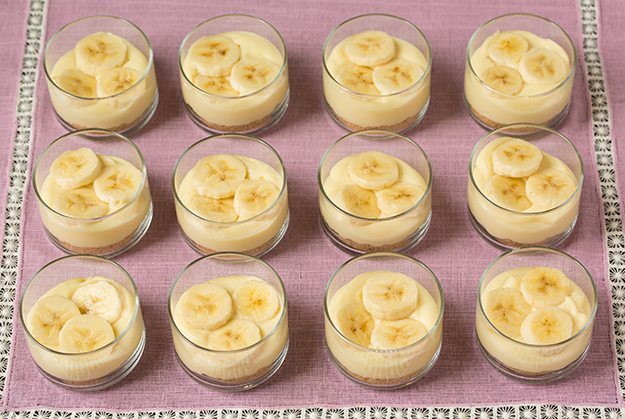 Store in refrigerator up to 2 hours before serving and garnish with a banana slice just before serving. *I wanted to keep my bananas from browning (this is optional) so I added 2 Tbsp fresh lemon juice and 1 cup of cold water to a bowl then I sliced the bananas and added them to the lemon water mixture and let them rest 10 seconds, then transferred to paper towels and dried. This does give them a very light lemon flavor so it is optional if you are worried about the appearance. Cissy Prestage: Are these the same ones? Look like the same size. Cissy Prestage: I think these might be the ones she used.